The Art Of... Reading to a Dog | The Art Of | Kids VT - small people, big ideas! At Eden Central School, Ms. Dempsey's kindergarten students squealed when Becca Reggio arrived at their door. Though it probably wasn't her they were most excited to see; rather, it was Cora, her knee-high, pointy-eared companion. 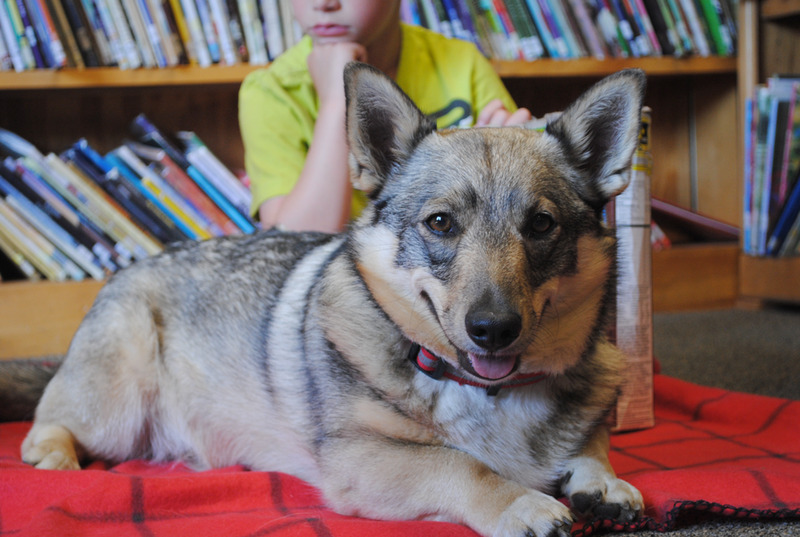 Reggio's Swedish vallhund has the charming ability to help kids feel more comfortable — and confident — when they read aloud. Reggio and Cora usually work with three pairs of students on their hour-long visits to the school, spending 20 minutes with each pair. Olivia and Liv were Cora's first readers of the day. Together they decided that Liv would hold Cora's leash as they walked down the hall to the library. Once there, the girls chose their books and helped little Cora up into the bay-window reading nook. Olivia opened an easy reader titled Sally's Red Bucket, and began reading as she absentmindedly stroked Cora's brown-and-black fur. Liv listened intently, scratching the dog's ears as the sun streamed in. When Olivia paused at a tricky word, Cora's head popped up. Reggio, who was watching nearby, looked at the troublesome part and helped the girl sound it out. "That's good, Olivia," she said. "Keep going." With the sprawled-out pup sandwiched between her and Liv, Olivia finished the book. After both girls had a turn, Reggio moved Cora out of the window because it was too warm. The girls didn't mind — as long as they could continue reading to her. Afterward, Liv mentioned how she loves to pet Cora's soft fur. Olivia has dogs at home, she said, but when she tries to read to them they run away. It takes a special pooch to be a reading dog. Reggio got easygoing Cora three years ago, and soon after started obedience and agility classes in preparation for the American Kennel Club Canine Good Citizen test. AKC examiners assessed how easily Cora was distracted, how she handled being left alone, how calmly she greeted new dogs and her reaction to sudden, loud noises. She passed with flying colors, which certified her for therapy work in community settings. Cora soon visited a handful of local schools and a nearby nursing home. Reggio, whose love for animals runs deep, became interested in animal therapy after observing a reading-therapy dog at a school where she used to work. Her dog at the time was not suited to the job, so she trained as a therapeutic horseback-riding instructor. When Reggio got Cora, she broadened her work to include dogs. Reading with a dog helps kids deal with their nervousness and performance anxiety, Reggio said. "There's no judgment when reading to a dog," she explained. "If kids stumble reading, it's no big deal because it's just Cora." 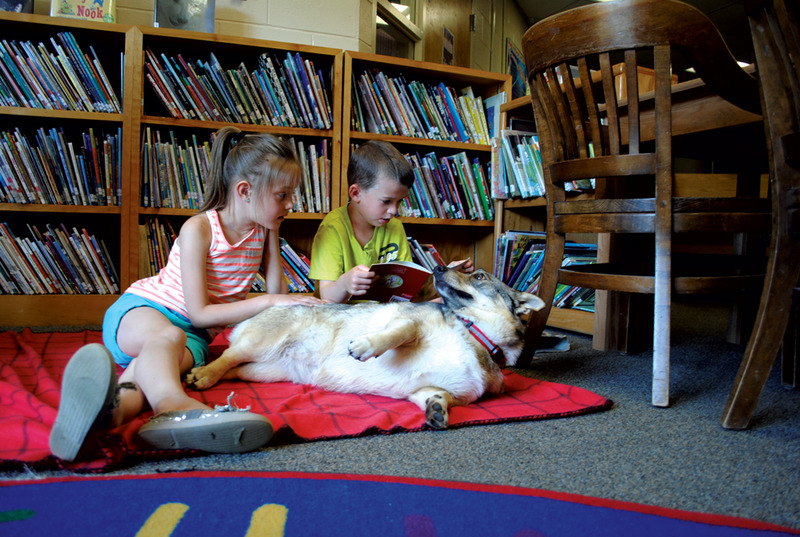 By the time a second pair of kindergarteners, Luci and Jeffrey, settled down on the library floor next to Cora, the dog was dozing off. Luci's fingers played in Cora's hair while Jeffrey looked on, stroking the dog's belly. When Jeffrey started his second book, his voice was a bit louder and clearer than it had been at first. Do the kindergarteners think that sharing books with Cora helps them become better readers? "Mmmm hmm," said Luci. "I can read Cat in the Hat books!" When their time was up, Reggio asked Luci to grab Cora's leash. "Come here, friend," the little girl said, clipping it to her collar. It's sweet moments like this that Reggio enjoys most. "It's novel for kids to step out of class and read to a dog," she said. "They love it." Want to Read to a Dog? Milton Public Library 39 Bombardier Rd., Milton (893-4644): July 12 & 26, 9 a.m.
Burnham Memorial Library 898 Main St., Colchester (264-5660): July 5, 12, 19 & 26, 3:30 p.m.